Categories: Child | Tags: Child, coolcalm, fast, fight, quick, shout | Permalink. Child: Mom, you make me so angry. Child: Always imposing controls on my cartoons.. Mom: If you had some self control, I wouldn’t have to impose. Child: India is a free country, don’t you know that so far? Categories: Child | Tags: Child, Country, free, India, Self control | Permalink. Mom : Oh! Sweeti, thank you so much. You are also very cute. Mom : Hey you fool, why were you laughing then..? Momentary happiness won’t be lasting. Even then,it is so nice if you can make a smile on others face for a moment. Categories: Child, Inspirational | Tags: aunty, beautiful, Child, face, happiess, impulse, moment, smile | Permalink. And on the other side, if you are not enforcing those rules and disciplinary actions, kids will feel really bad, like you are not bothered on them.. So never hesitate to have disciplinary actions. So switch the mode very often. Categories: Child | Tags: Child, consequences, disciplines, kids, mistake, natural, rescue, rules, save | Permalink. 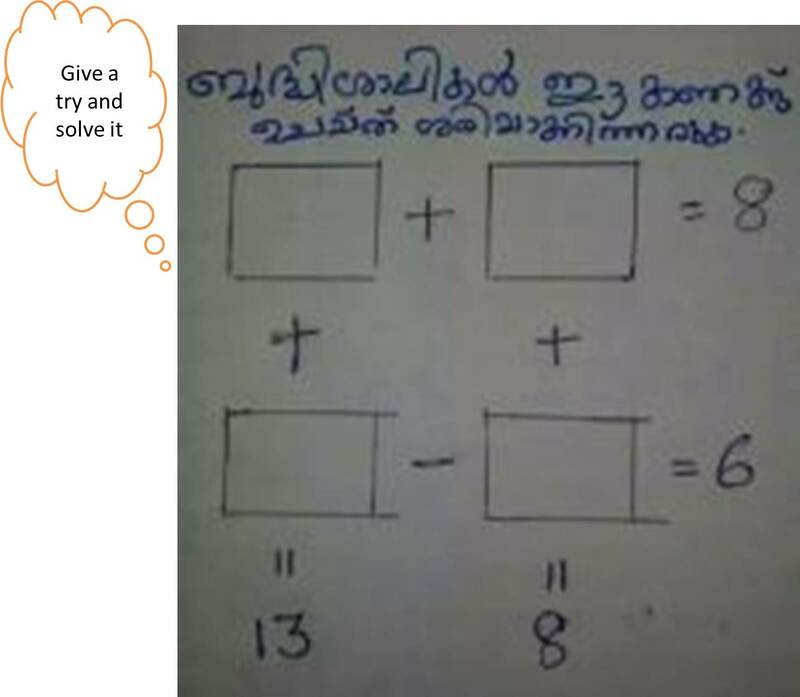 Categories: Child, Malayalam | Tags: Brain Teasers, malayalam, mathematics, puzzle, whatsapp | Permalink. Categories: Child, Poem | Tags: chance, cutie pie, ping pong, play together, probability, win | Permalink. My opponent was a little girl, not more than 10 years old. And when the game started I noticed that she had a wrong placement of king and queen (Or something like that, I don’t remember exactly). I thought, “Oh..this innocent kid, poor girl, why should I make her in trouble” I told her to correct it and the game restarted. After sometime, she called the arbiter. Did I make any mistake? My eyes scanned the entire board..no, nothing is wrong.. then what’s wrong with her..I thought. The little girl assumed that I was playing with right hand, as it is the normal way. And when she noticed that I was pressing the timer with left hand, a bulb lighted in her head. Anyway, it didn’t take much time to make it clear for her as the arbiter was the real witness to shield me. Another 10 or 15 moves over. I did a short castling. Again she stood up.. I scanned my board..the cycle repeated, found nothing wrong. The arbiter came and at once she said that I moved into check. Castling is only forbidden when an opponent’s piece controls a square that the king has to cross. Thanks God, I am saved this time, too. She might have got mistaken by the rules. After a few more moves, she called the arbiter again. My heartbeats started to increase. And this time, she had a complaint about the table, that it’s not steady.. Anyway the arbiter solved this problem too…the match continued.. Please don’t ask me who win or lose the match, I give full credit to that little girl as she gave me an alternative insight to her generation. Categories: Child | Tags: arbiter, castling, chess, Child, fide, kids, tournament | Permalink.